Suzanne Goin & Caroline Styne’s destination restaurant in Brentwood (who have recently made Gavin Mills, formerly of Wood & Vine, Chef de Cuisine) invites you to a night of election return watching on the flat screen TVs in the Blue Room. While the happy hour from 3 – 7 PM stands, all guests wearing an “I Voted” sticker receive Happy Hour pricing from 7 PM to closing at the bar. The patriotic on the Westside may appreciate that the marina-overlooking eatery will be throwing a happy hour during their election return viewing party from 4 PM to close. Add to that, the fact that blue curacao isn’t relegated to memories of AMFs at Saddle Ranch, anymore (who? me? never! ); it’s back in. Those with an “I Voted” sticker will even get a libation on the house with purchase of another cocktail. Downtown’s skyscraper-penthouse-Wolfgang Puck flagship will be serving the Rhetoric Remedy (orange vodka, fernet, lemon and champagne float) cocktail from November 1 – 10 for $16. Because the 360-degree view of L.A. is patriotic enough. The grass-fed, farmer- and environmentally conscientious burger chain is providing incentive by offering a free “½ and ½” combo to (that is, half onion rings, half French fries) to “I Voted” sticker wearers with purchase of any other menu item. Redeem at any location in L.A. or San Diego, though the closest ones to you are probably in Beverly Hills or West Hollywood. 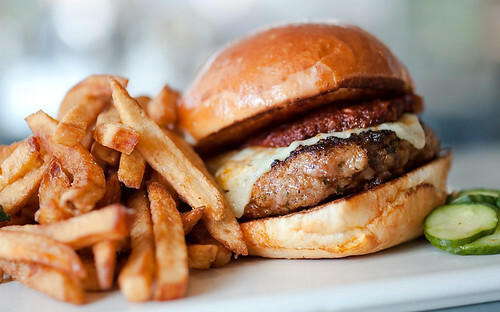 You’ll perhaps want to try this season’s (November – December) special grass-fed Bison burger. Every guest who comes in to Tortilla Republic during Election Day wearing their “I Voted” sticker will receive a complimentary “Viva La Vote” margarita. Viva La Vote is made with Maestro Dobel tequila, house made blueberry syrup, fresh strawberry and raspberry purée, lime sweet, and blue curaçao. The patio at Tortilla Republic is always a joy, too. By the way, those are the colors of our flag. Post & Beam’s Tuesday night wine special continues on this night with 50% off select bottles of wine, while supplies last. Take-away a Suzanne Tracht-cheffed meal to enjoy in the comfort and privacy of your own home while you watch the returns, you surly introverts. For $63, you’ll serve up 2 complete dinners, including 2 sides. This excludes tax & gratuity, and yes, the “no substitutions” phenomenon has now reached your living/dining room. Orders must be placed at Jar by credit card no later than 5 PM on Sunday, November 4, 2012. Pick-up may be scheduled for Tuesday, November 6, 3-7 PM. So if you haven’t voted early, be sure to visit the polls next Tuesday. Your constituents in life will thank you. Now you’ll have reasons other than pride to wear your “I Voted” sticker. 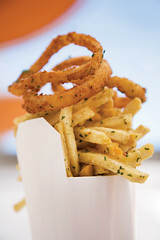 This entry was posted in Beverly Hills, Brentwood, cocktails, Crenshaw, Culver City, Deals, Downtown LA, Events, Food, Hancock Park, Happy hour, Hollywood, Marina del Rey, robertson, Take out, West Hollywood and tagged Beverly Hills, Brentwood, burger, Burger Lounge, Cafe del Rey, Caroline Styne, cocktails, Crenshaw, Downtown LA, DTLA, Election 2012, Election Day, flight, Govind Armstrong, Hollywood, Jar, Lexington Social House, los angeles, Marina del Rey, Post & Beam, Presidential, slider, specials, Suzanne Goin, Suzanne Tracht, Tavern, Tortilla Republic, West Hollywood, Wolfgang Puck, WP24. Bookmark the permalink.